In the 10 years since Doctor Who returned to television screens around the world, five actors have played new incarnations of the central character. These days, fans are blase about the Doctor regenerating, or even about whole new past incarnations being shoehorned into prior continuity, and most people have forgotten how unexpected the changeover in lead actor was at the end of Series 1. When David Tennant took over from Christopher Eccleston in The Parting of the Ways, he was faced with a challenge almost as great as his predecessor’s. Eccleston had to convince audiences that the programme was worth watching, but Tennant had to persuade viewers that changing the show’s star was acceptable only 13 episodes into the modern series. He succeeded in that task, and then some! With Matt Smith and Peter Capaldi turning in such memorable performances after Tennant’s tenure, it’s easy to forget how great the Tenth Doctor’s era was. Some of that greatness came from the welcome reappearance of old foes like the Cybermen and the Master, but many of the funniest, most thrilling, and most moving moments were provided by the tremendous acting ability of the leading man himself. 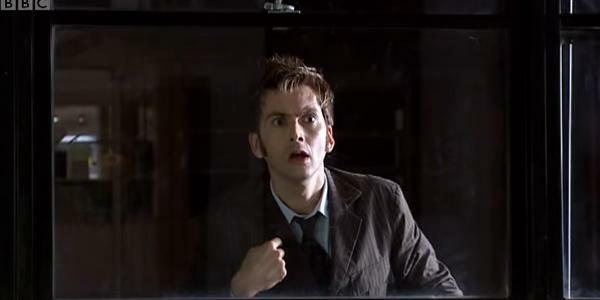 Here are the 10 best moments of David Tennant as the Tenth Doctor. Let’s begin this list by crying “allons-y!” with a cheeky grin and a wink, in classic Tenth Doctor style!